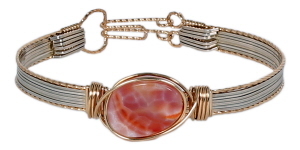 Though commonly called "fire agate" this is not the naturally occurring stone from which it is named. 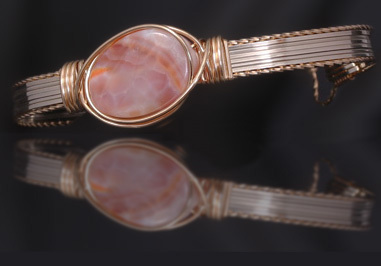 Yes, a natural agate in origin, but dyed and heat treated to create the crackled effect. 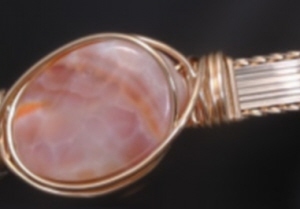 Like the colors of the sunset, this bead is a pale burnt umber in color, cut into an oval shape and measures 18 mm x 14 mm. Bangle is constructed using argentium silver wire and accented in 14kt rolled gold wire. Best fits a wrist measurement of ~6¼ inches. Weight is 0.4 oz.